The food was excellent as always but the prices have really gone up. The filet mignon that was in the twenties has gone up to $36 which is sort of expensive for this type of restaurant. Also the glasses of wine are really expensive for a similar type of restaurant. Otherwise the food was excellent. the worst experience ever - horrible service and terrible tasting food. They were out of pretty much everything we asked for: wine, pasta, and salad dishes. The worst really! I had chicken medeira and the chicken was tough and awful. up the wine and vodka order. How could you mess that up? We had to ask a hostess to get our waiter to give us the check after waiting 22 minutes for it. Not a happy camper at BRIO. Lovely to sit outside and relax! Very reasonable and one of the view restaurants around that one can sit outside!!! We had a large party celebrating my mother’s birthday. The restaurant was so terrific with arrangements. And our server Mark was incredible! The food was delicious and fast. Many thanks!!! Terrible service, food overcooked, had to get my own water from the bar, and food was cold. Will not be coming back! Very disappointing considering it’s very close to our house and we have had good experiences here before. I order the Lamb Chops for the first time and they were superb, highly recommended. Our Server along with our food was excellent! Food was undercooked and for some in the group tasteless. Considering that the restaurant was completely empty, service was slow. It’ll be a long time, if at all, before I consider going back to Brio. We sat outside because it was nice weather. The service was slow and maybe understaffed? By the time i got my first drink, it was completely watered down. When we got our food, it was just plain. It started to rain so we didn’t get desert, but the patio looked beautifully lit. Restaurant was very flexible in switching our sitting from inside to outside. Food and service was good. Staff was very accommodating and pleasant. A delightful dining experience. they were out of one of the brunch drink specials and then refused to provide a reasonable replacement. The espresso machine didn't work and they didn't offer to comp us our dessert---dessert isn't ideal without coffee. there was a group of drunks (party of over 30) INSIDE and not using a private room. It was so loud that we couldn't hear ourselves talking. we went to dinner to celebrate my boyfriend's birthday and talk to them so that after dinner they would sing to him by surprise happy birhday with some dessert with a candle and they forgot that detail of the night! for me an error in the service in that aspect because I could not during the dinner get up to remind the waitress because my boyfriend was going to realize. finally we asked for the account and I left very dissatisfied when I saw that they had not come. Food excellent,the attention leaves something to be desired. Not a good idea with small kids on a weekend evening! Took over an hour for the food to arrive. The food was really bad. The chicken limone was tasteless; a hint of lemon taste and no seasoning. The carbonara was totally dry; no creamy sauce present. The men’s room was really dirty. Great bar, great wait staff, good food, quick service. I'd like to see a slightly larger menu selection. Food was good and fairly priced. The only complain was we were sitting outside and where they keep the trash and empty lates - such area especially around the floor was very dirty. Manager should make sure such is in a proper condition and clean. 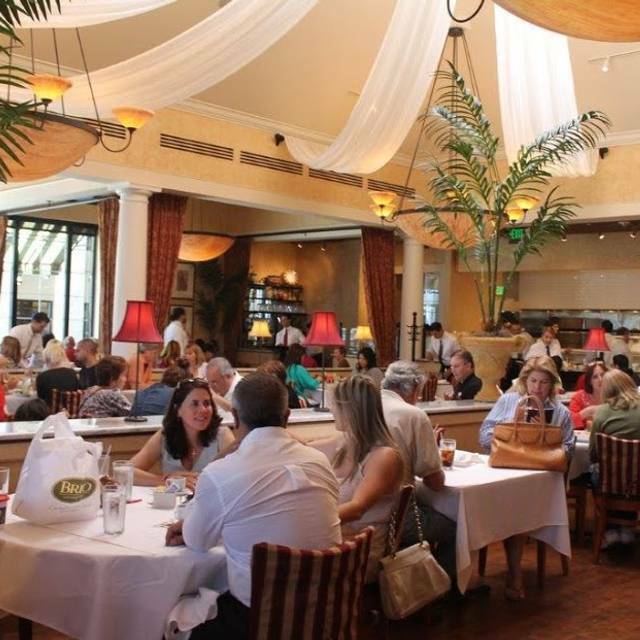 We have been going to this Brio on a regular basis since it opened years ago and we keep going back because we love everything about it. BUT this past weekend was absolutely the worst experience we have had. We always dine with our best friends, and we always bring wine because my friends are wine experts. As soon as we asked William to uncork the bottle, there was an attitude. We then explained we were in no hurry but within 10 minutes he returned to the table 4 times asking if we were ready to order. When we were ready to order, we explained we were going to take advantage of the Buy One Get One deal (they brought back everyone's faves) and another ho hum attitude. After ordering it took over 35 minutes for the meals to come!! We tried to flag him down as he ran all around us but finally the manager came over to explain that the problem was the beef medallions had been overcooked and they were in the process of re-making all our meals. I didn't believe this but ... Another 15 minutes went by and I happened to look up and I saw the runners take plates from under the warming lights! 3 meals had been sitting there for god knows how long! Mine came with mashed potatoes and the insides were cold. Obviously not redone. The only decent plate was the beef medallions that were apparently remade as the manager said. What really gets me upset is lack of any compensation for the poor service, the below standard food, and the overall crappy experience for the entire evening. AND the waiter, William, had the nerve! to question the tips we left at the end of the meal!! He's lucky I didn't have the manager come over again! Yes, we'll back, but I believe more should have been done to improve our experience for that evening. 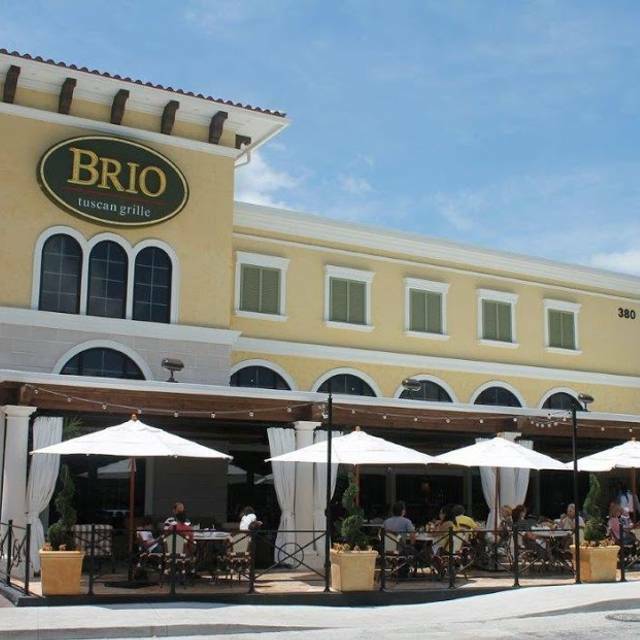 Brio’s food is very good and the have some good promotions that are excellent for their repeat customers. Went for Valentines day with my girlfriend. I know they were slammed. But it seems they weren't fully prepared. Needed more servers on. Service lacked due to poor management choices. Ran out of all the good bread chips etc... got one drink order in. Took 45 min. To get food. Never asked to refill cocktails or water. Not servers fault. Well not entirely. This being said. They do have great food and for the value. Will keep coming back. Changed menu and took away many of the best options. Hopefully, they will see the error of their ways and change it back. Server was rude to top it off. Ambiance & food was perfect. Drinks & food are always done just right. Love to dine here. Fond memories of wonderful meals. 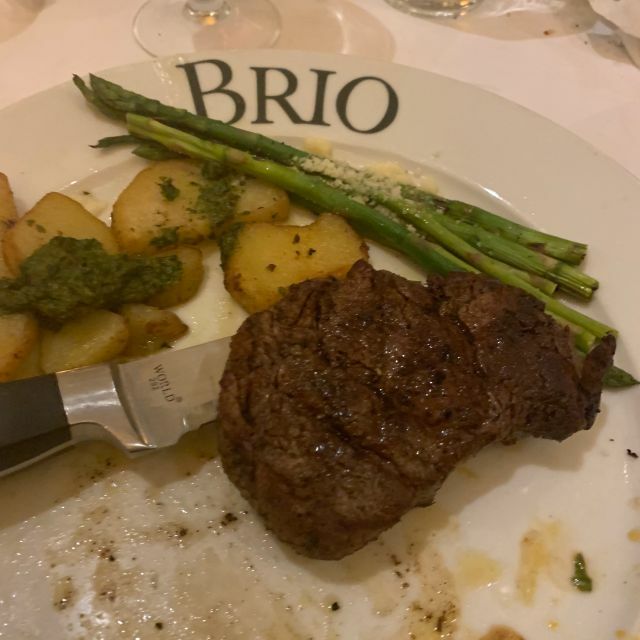 The food was not as good as other BRIO restaurants.... the steak wasn’t good and the sides appetizer were both disappointing. 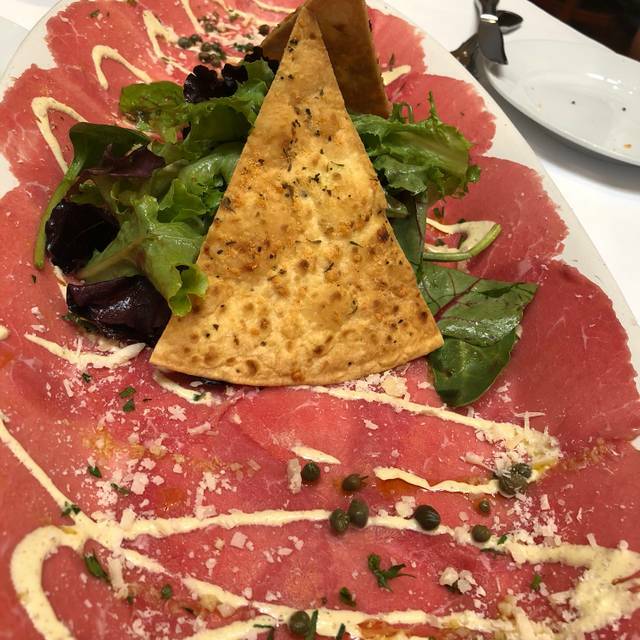 The service was great as always with all BRIO restaurants but the food wasn’t good. We had a great time , our server Gabby was very friendly. I have never felt so bad in a restaurant the waiter was rude unpolite and very unprecise, I was embareced by the poor treatment received. The waiter was so rude that I used his examples to teach my kids how not to treath clients. It will be a very bad memory to me and my family. Server rushed our party of 4, picked up plates when one person wasn’t done eating and then gave it back after he had put other peoples plates on top of his, didn’t offer desert to anyone else at our table, only gave desert to birthday person, overcharged us and had to have him correct it, really, really RUSHED us through the entire dinner. We sat outside and was placed next to a clean up station, very noisy. I had made a reservation and asked for a nice table as it was our son’s birthday and asked for a cake for him. I was told you sing happy bday but after the fact found out differently. We had a group of ten. The waiter came to take the order at average rate. The rest of the night service was very slow.